Have you ever thought about Paul’s thorn in the flesh and wondered what it was was or do you just accept the general answer that most of us have heard — oh, it was a vision problem? Do you accept that answer as fact or do you search the Scripture to see if those things are true ... (Acts 17:11)? If you haven’t, you might want to because you might have a thorn in your flesh and want to know what to do about it. So, let’s look to see what Scripture says about Paul’s thorn and how we might get a better understanding of our thorn. Paul himself says — Because of the surpassing greatness of the revelations, for this reason, to keep me from exalting myself, there was given me a thorn in the flesh, a messenger of Satan to torment me — to keep me from exalting myself! Concerning this I implored the Lord three times that it might leave me. And He has said to me, “My grace is sufficient for you, for power is perfected in weakness.” Most gladly, therefore, I will rather boast about my weaknesses, so that the power of Christ may dwell in me. Therefore I am well content with weaknesses, with insults, with distresses, with persecutions, with difficulties, for Christ’s sake; for when I am weak, then I am strong ... (2 Cor 12:7-10). From studying these few verses, we know enough to know that Scripture clearly states that it was a fleshly thorn, a messenger of Satan to torment Paul, to keep him from becoming prideful because of the greatness of the revelations he had received — remember, pride comes before destruction ... (Proverbs 16:18), as happened with Satan when he decide to exalt himself above God ... (Isaiah 14:12-15). We know that Paul asked the Lord to remove the thorn (a messenger of Satan) but the Lord did not, rather letting Paul know that His grace was sufficient and power comes from weakness. And lastly, we know that Paul learned to accept this fleshly thorn leading him to say that regardless of the circumstance (weakness, insult, distress, persecution, difficulty) he is content. Think about it — if we take the Word of God at face value, it seems as though we do know what Paul’s thorn was ... it was a messenger from Satan to torment him, probably all the time. This is why Paul said regardless of the circumstance, he is content. This is good news for us, too! How so? Because whatever our individual thorn is, we can rest assured that God’s grace is sufficient for us regardless of our thorn; for when we are weak, Christ is strong. Now, if only we can learn to be content! The world is a mighty big place, with ~7 billion people living in 196 countries—that’s a lot of people scattered throughout the world. And to think, the Lord commanded us to go into all the world and preach the gospel to every creature ... Mark 16:15. Does this “go into all the world” boggle your mind as to how you can go into all the world? Sure, you might belong to a church that sends out missionaries and you provide financial support to these activities but how do you “go out into all the world and preach the gospel”? Let’s think about this in bite-sized pieces. People comprise the world, right? People are all around you, which means the world is all around you. Did you ever think about an apartment complex as the world? Look at this image, how many worlds do you see? There are six worlds going on, with each window representing the world in which someone lives. What about a neighborhood or a trailer park? A house, a mobile home, or even a houseboat, represents a world in which someone lives. We are surrounded by the world in the days and times we live; a world is next door to us. The next time you walk past an apartment complex, think of all the worlds that are going on, many of which will be experiencing hopelessness, depression, drug addiction, financial situations—to name a few. Be the one who goes into the world to bring the gospel to that world—the Good News of the Kingdom of God and the name of Jesus Christ ... Acts 8:12. Do you ever find yourself in situations where you overhear conversations and it causes scripture to come to mind? Or, you are sitting around thinking about random things and scripture comes to mind. No? Well then, let's look at some examples and see if anything pops into your mind. While talking with a co-worker, one woman was overheard saying that she really enjoyed her job, but didn't respect her supervisor. This in turn would cause her to dread going to work and not enjoy the job she said she enjoyed. And, unfortunately she would go home and carry this attitude with her. What comes to your mind when you think about this conversation? Are you thinking, I know where she is coming from! 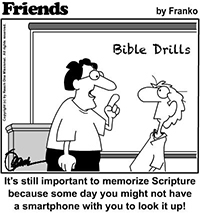 Or are you thinking, hey, there is a Bible verse that speaks to that very thing! Did you know that there is a Bible verse that speaks to the very situation this lady finds herself in? Well, if not, there is ... Colossians 3:23 ... whatever you do, do your work for the Lord rather than for men. How about you, when you work, do you work as if you are working for the Lord, or do you find yourself constantly grumbling and complaining about what you are doing? Granted, we all complain and grumble at times but it should not be a way of life for those who have put their trust in Christ as Lord and Savior, because we have so much to be thankful for each and every day! Have you ever noticed when someone has a disease how it causes them to want to find a cure for the particular disease? Let's take cancer as an example, because most everyone is impacted by this one way or the other at some point in their life. There are so many different types of cancer — breast, lung, thyroid, pancreatic, ovarian, and so forth. It seems as though each cancer has a ribbon to show your support in helping to find a cure. And rightly so, because to get a diagnosis of cancer is a scary thing! Thinking about this, wouldn't it be great if all of those who are true Christian's put as much effort into helping people find the cure for the greatest cancer of all — sin — as we do for the diseases that have a ribbon. The Bible says that we are all born with a sinful nature and are destined to die as a result of this cancer. He must be correct, becuase since the beginning of the human race, we are all dying. There is a cure for this greatest cancer of all — the cross of Christ on which He shed His blood so that we could be cured of our cancer! That is our ribbon, and such a powerful, powerful ribbon! As you think about this, do you wear your ribbon? Do you support your ribbon? Do you share your ribbon with those you know who are not Christians? If not, why? After all, He died for you, will you not live for Him? Surely, the time will come when you will regret that you did not share your faith in Jesus Christ. Have you ever had someone ask you to pray for them without wanting to telling you what to pray for? If you have, did you know what to pray or even how to pray for them? It’s happened to me before and I will admit that I was somewhat lost in knowing how or what to pray for the person. One morning, when listening to Dr. Charles Stanley, he taught on a “Life Changing Prayer” based on Paul’s model of intercessory prayer found in Colossians 1:7-14. After listening to Dr. Stanley, I went to his website and downloaded his Life Principles Notes, which he provides as a summary of his sermon. How many times have you heard it said “the lion will lay down with the lamb?” Probably quite a few times. Did you know this isn’t scriptural? 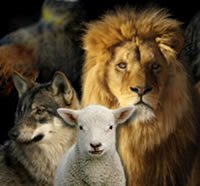 In Isaiah, it is stated that the wolf will dwell and graze with the lamb ... Isaiah 11:6, Isaiah 65:25. Nowhere in scripture does it state that the lion will lie down with the lamb. Check it out; you can't find it. There may be many things in the Bible that are somewhat difficult to understand; however, we should get the facts correct on the easy things. 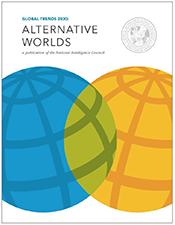 The following U.S. organization, the National Intelligence Council, has pulled together a report projecting global trends as far out as 2025 and 2030. 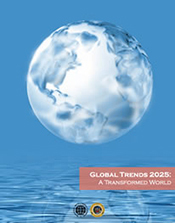 The first report, Global Trends 2025: A Transformed World, projects trends around the world showing growing global conflicts as a result of scarcity of energy, food and water due to urbanization and population growth, and rogue states and terrorists groups with greater access to nuclear weapons. The report also projects trends of widening wealth-to-poverty ratios, birth rates, and climate change. It also goes into an overview of China, India, Russisa, and Brazil coming to the forefront in power, and the U.S. sharing leadership with China and India. For those familiar with the Bible, these projections should come as no surprise. For example, the Lord Himself said the time would come when a days wages would only buy bread for the day ... Rev 6:6. It seems as if the Global Trends 2025 report is projecting what God already said would happen one day in the future, only He said this 2000 years ago. A quadripartite world governed by the U.S., China, India, and the European Community. Global growth to 8.3 billion people in 2030 will likely increase the demand for food, water, and energy by 35, 40, and 50 percent, respectively, by 2030. Continued climate change and the struggle for resources only becomes more intense. Although the reports are rather lengthy, they are very interesting to read, especially if you have a solid understanding of the Bible and know where we're headed. If you're interested in reading either report, you can click on the report cover to view the PDF and save it to your computer, or you can go to the NIC website to download the 2025 report and the 2030 report.